Sultry meets ethereal, the Wildermere headpiece is a floral arrangement that ticks all the right boxes. It embodies our love for the botanicals with its delicacy and floral inclusions. This wild and untamed piece was designed for garden or beach ceremonies and styles beautifully with a veil. The tones of soft silver and pale champagne adds subtle colour to this dramatic headpiece. Colours are customisable. Colours: Silver/ivory, silver/champagne, gold/ivory or gold/champagne. The Wildermere bridal headpiece is made to order. Please allow 3-4 weeks for production plus delivery times. 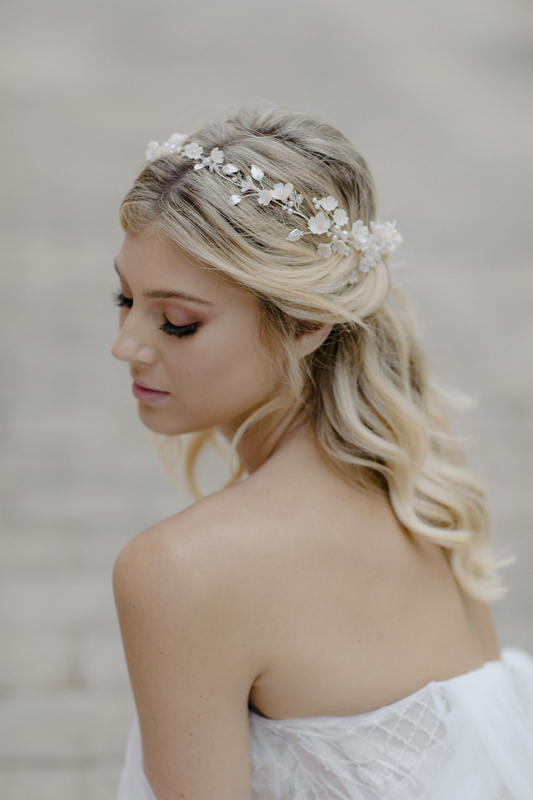 The Wildermere headpiece can be worn two ways – across the hair line as a headband or flip it over and wear it from behind to frame a half up hairstyle or updo. It’s a flexible and versatile design that can be manipulated to the shape of your bridal hairstyle or hair bun. The Wildermere can be styled with a veil. Browse our full veil collection or contact us and we’d be happy to offer a recommendation to suit the Wildermere based on your wedding dress and hairstyle. Colours can be changed including replacing the champagne flowers with ombre or blush flowers.